Hey everyone, we’re still walking on Latino sunshine from how well the event went last Saturday, thank you for helping us make it happen. Now we gotta make this Saturday just as big of a success! Go to our Facebook invite, we had to make a new one, and click join, join on in on the fun. And make sure to share with all your friends. And we mean all of them. 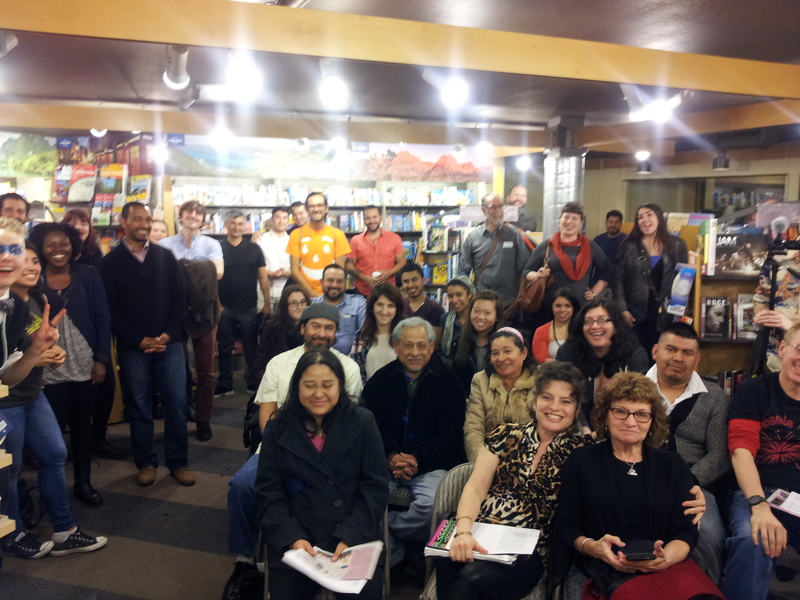 The festival is focused on Latino writers but we want our shows to inspire unity, last Saturday we were so incredibly happy to see a very diverse crowd, black folks, white folks, asian folks, latinos, queers, of all shapes and sizes were in the audience enjoying the poetry. We were so thankful. So don’t forget folks Saturday April 12th! At Magnet, starts at 7:30pm FREE! Now check out this awesome video, an interview with one of the readers of the show on Saturday Jaime Cortez! 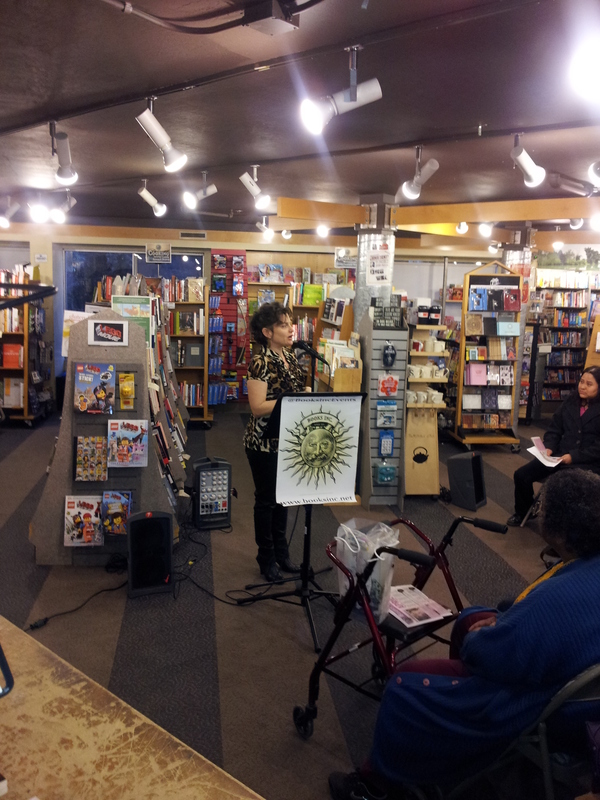 And check out Denise Benavides! She performed last Saturday but we weren’t able to get her video up because our computer is old and cranky and kept crashing. But check out the video!! 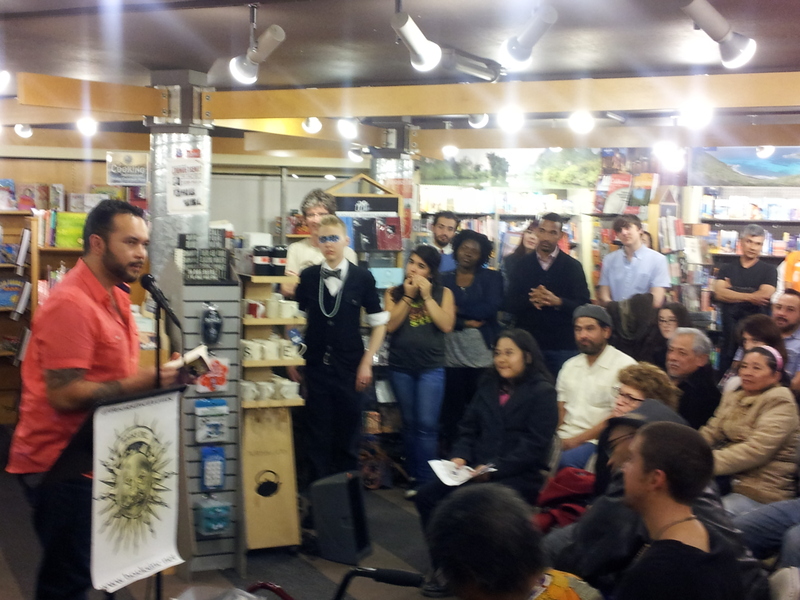 Our First Night Full of Love, Passion, and Poesia! The show tonight was packed! Packed! I’ve never seen Books Inc full of so many people! The performances were fantastic! I am so grateful! I am so thankful to each writer, the Bookstore staff, especially their event coordinator who worked so hard to make us feel welcome, and honestly gave me probably one of the best introductions I’ve ever had in my career, wow! 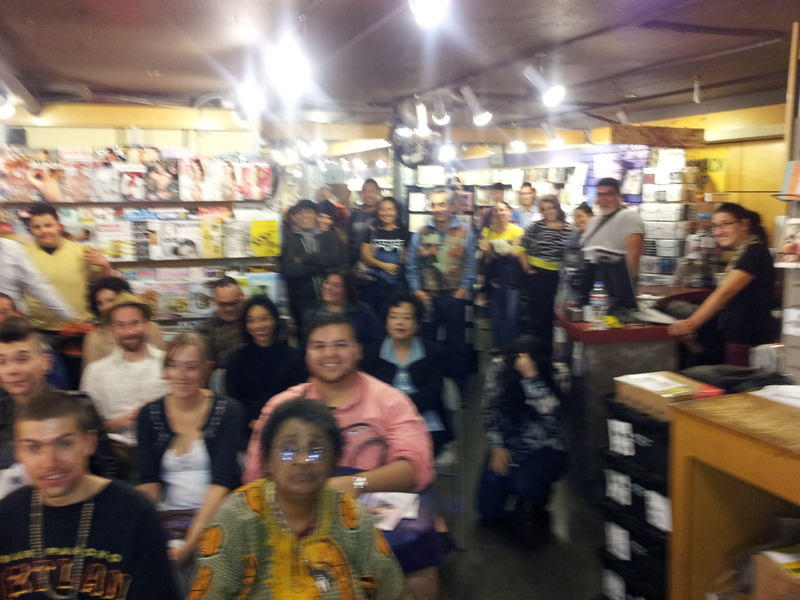 Thank you to everyone that came out! To Galería de la Raza, to Bob Guter, and everyone that made tonight a success! Check out some fotoso from el Show! Right when we got there the bookstore was ready! they were so thoughtful and patient and had the mic and chairs ready, aaaand they had bottle of water for us! I was so busy and frantic I don’t even know if I was able to get the bottle to all the writers. When I got there, people were already there waiting for the show to start. I handed the program to everybody and made sure to keep one for later. 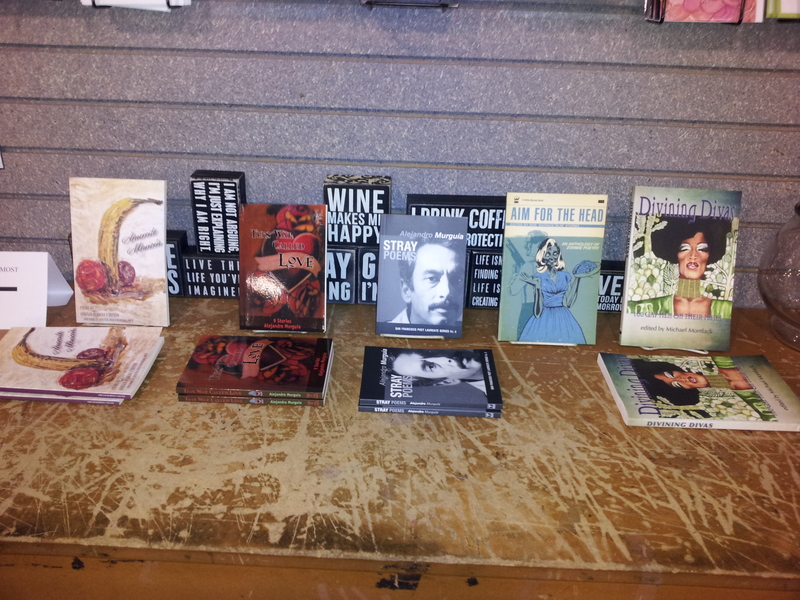 The bookstore had our back, look how prepared they were with the books pertaining to the writers! I had the pleasure of hosting the show with the incredible Sandra García Rivera, who hosts and curates the Lunada Literary Lounge at Galería de la Raza. She was so much fun to work with. Without her and Galería, this event would have never happened. 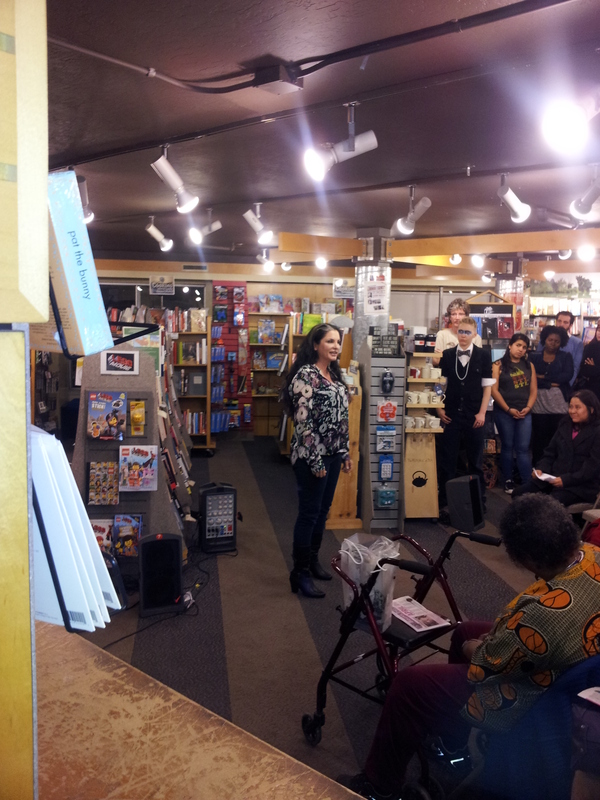 She did something very important that night, she reminded that we had to pay homage, respects, and take a moment to name all the poets that have done literary events like this in San Francisco in the past. She did, she named a long list and it was incredible to find out some of them were in the audience, what an honor. She bookstore kept getting fuller and fuller, I was afraid we were going to get in trouble. 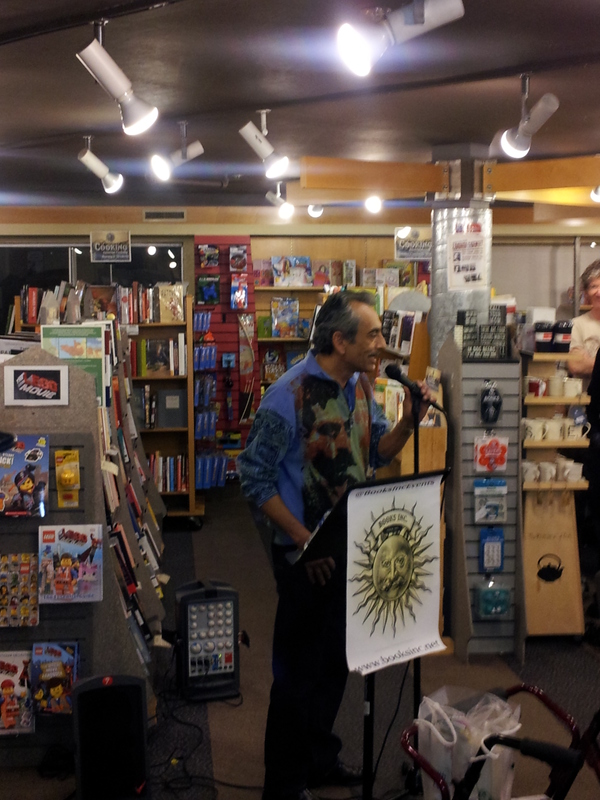 Very very honored to have had Alejandro Murguía the poet laureate of San Francisco be a feature at the show. His performance was incredible. 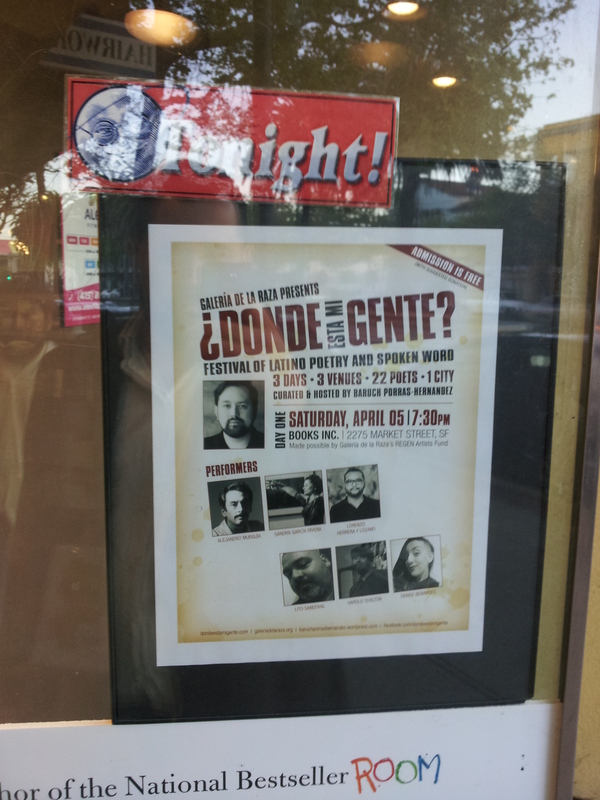 DON’T MISS next week’s part two of ¿Donde Esta Mi Gente? At Magnet on 18th in the Castro! 7:30pm FREE! New video! With Lito Sandoval! Check it out, we went on a walk with Señor Sandoval and got to know him a little. He is hella funny, intelligent, and likes Superheros. 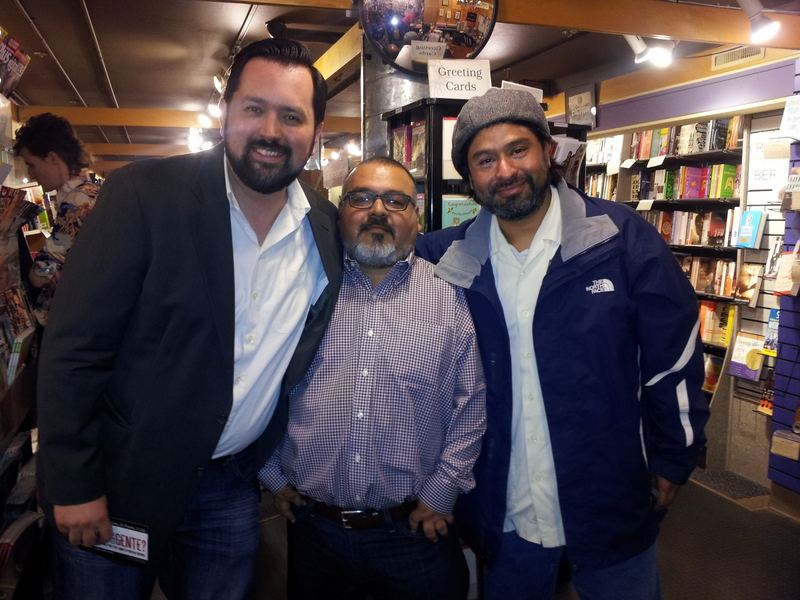 Here is an interview with him, and don’t miss him tonight at Books Inc. In the Castro 7:30 FREE. First chapter of our video series! Buenos dias! Ready for the fist installment of video interviews with the participating artists for ¿Donde Esta Mi Gente? Our first writer is very special to me, to the community, to writing students everywhere, she is a Writerscorps teaching artists, organizer, singer, and on top of that poeta. 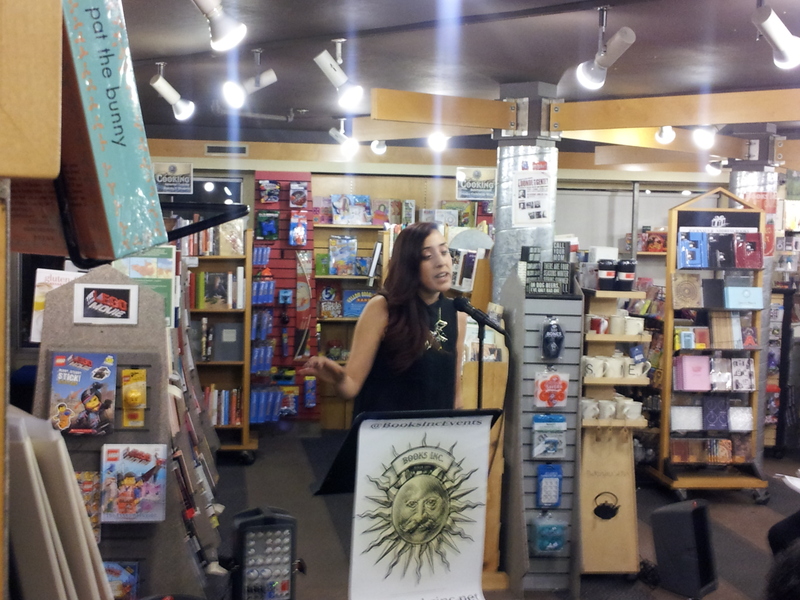 Check out Sandra García Rivera, and don’t miss the reading this Saturday at Books Inc! Whats up Gente? We are so close to making this happen. We want this to be a top notch event, and that every writer will get a little bit of money for their performance. Go to this IndieGoGo campaign to help us make this show a success. Also, watch the funny youtube video! This show, this website, this festival, is hopefully going to answer that very question. Hi folks! 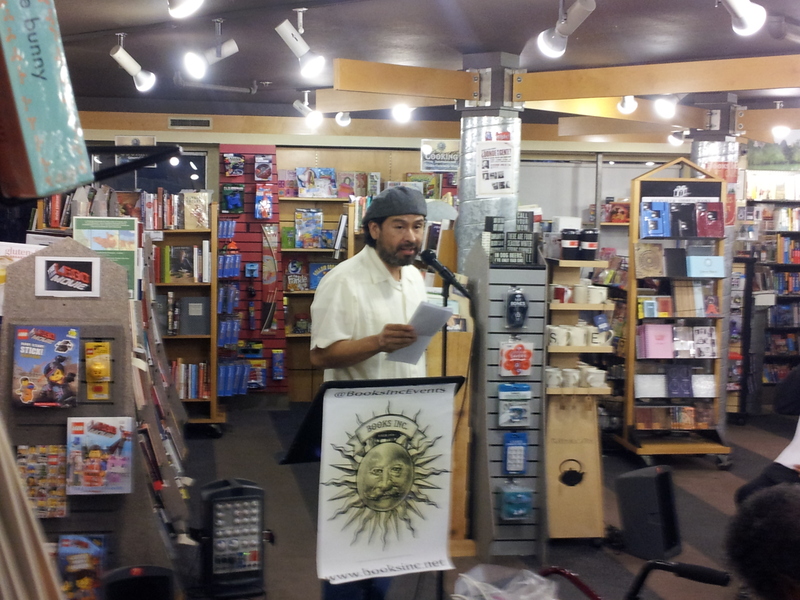 My name is Baruch Porras-Hernandez, I am a writer performer based in San Francisco. For the past 10 years I’ve been working as an actor, performance artist, writer, performance poet, I’ve been in slams, featured all over the place, performed in D.C., Canada, Queer Slams, Poetry Cabarets, but in that whole time I had not experience a lineup of Latino writers until I stepped into the Lunada Literary Lounge and Open Mic at Galería de la Raza. Sandra García Rivera and the folks at Galería changed my life. 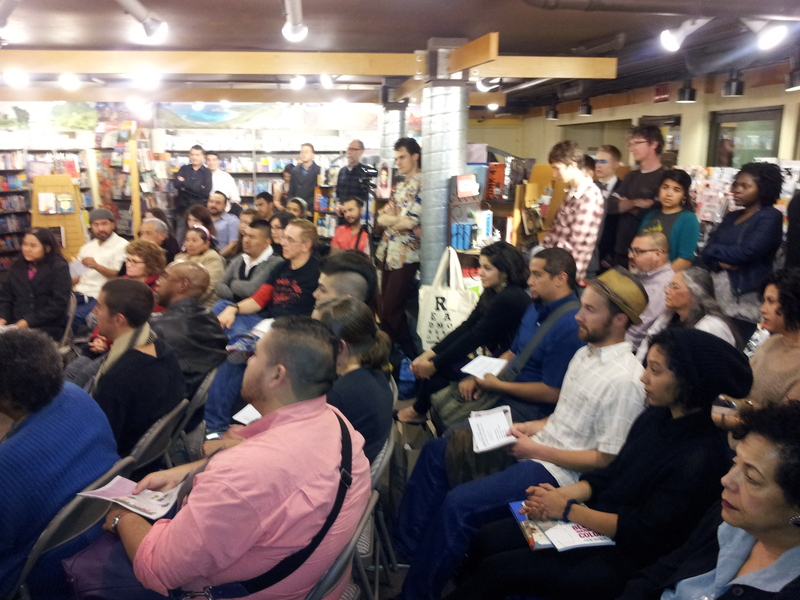 I realized I had never been in a space full of Latino artists like me, or encountered a Latino focused event. The Lunada, and Galería de la Raza opened its arms to me and was like, “We’re right here, bienvenido.” and I felt like I was home. So I decided to continue that feeling, help Galería continue their mission of supporting and promoting the incredible work of Latino Artists in the Bay Area with this poetry festival ¿DONDE ESTA MI GENTE? The title is a question because for the longest time, while I was trying to keep my head above water in a whiteartist world (no shade, LOVE my white artist friends) I kept asking that question, ¿Dónde esta mi gente? I didn’t know about Galería, I didn’t know about the Lunadas and how important they are. In a city like San Francisco, chop full of all sorts of Latinos we don’t even have a Latino Theatre Company, which is why Galería is so important. Which this festival I hope to create more buzz, more focus for Latino writers, (not that they need it, my fellow Latinos work it! And they shine!) but to also bring it out to the rest of the city, not just the Mission, the first show will be on Market street, near that Church and Market area in an awesome bookstore that supports the literary community Books Inc.! The second show will be in the heat of the Castro, at Magnet on 18th, right across the street from Badlands, haha. And the last show with the biggest line up will be at one of the best spots in the whole city, Galería de la Raza, for one big fundraising party. I hope you join me, and the other 22 escritores, poetas, artistas in celebrating the Latino voice and come enjoy poetry each night by a great line up of fantastic writers. 3 shows! 3 different increible line ups, 1 city! Check out the Participating artist page to find out more about the writers! Go to our shows page to find the when, where and what time of each show! Stay tuned for more info! And some awesome videos to come!